Special Collection and University Archives serves the Samford University and Alabama Baptist community. The collection is open to the public and all researchers are welcome to use the materials during our hours of operation. We recommend outside researchers contact the collection for an appointment to insure the availability of our staff members during your research visit. If the collection is in use by students, a class or group; outside researchers may be asked to wait before materials can be pulled for use. The mission of the Special Collection Department of the Samford University Library is to document The History of the University, The State of Alabama and Its People, and Alabama's Religious Institutions through the acquisition of historically significant, rare and/or unique materials. Special Collection is located on the lower level (maps) in the Samford Univesity Library. 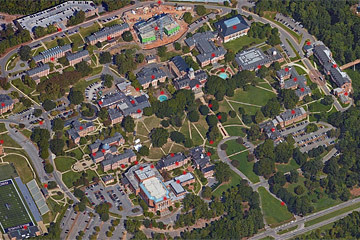 If you are not familiar with Samford University or the Birmingham area, maps are available to assist you. The collection is open the public Monday – Friday 9:00 am–5:00 pm. Since hours may vary during session breaks and holidays, please check the library hours (view by month) before visiting.